I’m pretty sure that my book also says to use 4/4 hardwood. So, what if you have a nice piece of 5/4 sitting on the wood rack for the past few years? Should you start by flattening one face and then scribe the thickness down to 4/4? Drill the saw nut holes and start shaping. This is true for all of my projects and I try to get this point across to all of my readers and viewers. If you have other wood species or other thickness’ of stock then use them. Full size pattern on quarter-sawn cherry blank. I rarely measure exact board thickness. I’ll take it off the wood rack, have a quick glance at the rough thickness, and then dimension it square to itself. If it starts out as 4/4, it may very end up at 15/16-in. or even 3/4 if it’s a difficult piece to flatten. Whatever it ends up at, is usually OK by me. But otherwise, this is a hand tool project, use what you have and don’t worry too much about thickness’. Shape the piece so it feels good in your hands- that’s the point! Could you use thinner stock if you have smaller hands? One of my earlier prototypes was a 3/4-in. walnut and oak plane. It felt a tad thin for my hands but it still does the job. pick up your favorite, and most comfortable saw and hold it in your hand. you could go a step further and shape the tote to match as well. Can guess what that is ? I wonder if that tote, is maybe , errr might be, kinda of like,,,,,,, a Bad Axe Saw????? Looking forward to the next video on that kerf plane Tom. Thanks. Looking forward to making this. Thickness is really relevant in this case is it? Also looking forward to making more with hand tools. Space,cost, noise and not to mention the dust. Hi Tom my issue is with planing I suppose you’ve gathered that in another earlier post, the only dilemma I have with it is taking out a hump or hill as I call it. I go across the board 90 then 45 both ways then finish vertically. Now this is where the dilemma lies there’s still a hump in the middle. I lay across the board a straight edge and it registers flat but vertically it isn’t. So I start planing straight down the middle until the hump is gone and you can see a visible gap if you check it with a straight edge across the board but again if I place the straight edge in the middle of the board vertically the straight edge just freely moves around instead of getting friction like you would on a flat timber. This really frustrates me as I just give up and move on. Any tips or ideas on how to resolve this. thanks for the question and sorry for the delayed response- I must have missed this one. So here’s another step to add to your routine and that’s ‘stopped shavings’. After you’ve completed steps 1 and 2 on your list, the 90 and 45 both ways, try working only the center of the surface for a set or two. Start the plane about an inch in from the end and lift it about an inch from the opposite end. Work in from each side as well and in your mind, try to plane a slight ‘hollow’ in the center of the surface. Once this hollow is established, finish as per normal working with the grain and see if this resolves your problem. Remember, this is the first side, your ‘reference face’ and the second surface will be scribed and referenced off of this first surface. Why make the board S6S? The top edge will in any case disappear. Isn’t it that what really matters is having the saw plate parallel with the side of the rabbet which will act as a fence? 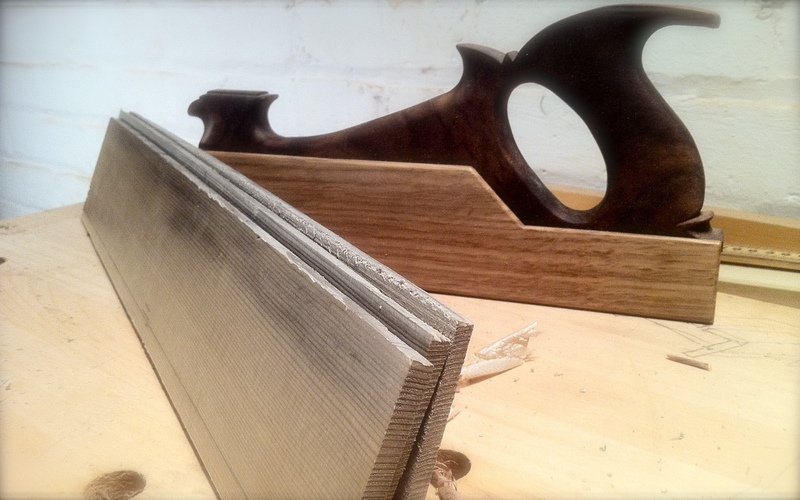 As an alternative to the kerf for the saw plate, what do you think of a second rabbet (not as deep as the fence one) and a wooden lath or a flat iron or brass to pinch the saw plate all along? Harder to say make the two sides of the blank parallel and the bottom square for the rabbet! At any rate, yes, no need to square the top edge as it will indeed be shaped – I don’t think I did either. 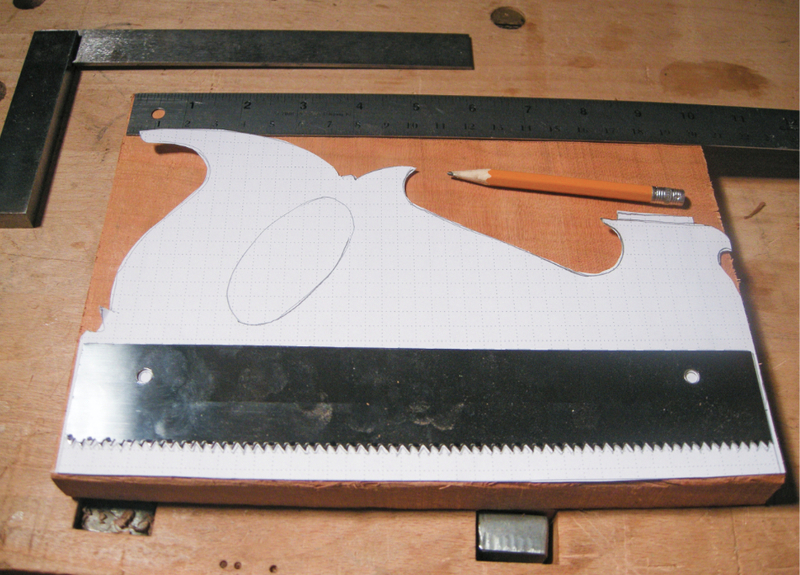 As for the suggestions on second rabbets and pinching saw plates…yes, of course, and all of the above. I’m sure you could come up with many alternate ways of making this tool work and I encourage you to try them. I’d love to hear how they work out. Shop made tools are a wonderful exercise in ingenuity, there are always going to be other ways, other methods and other design ideas. This is just the first step of mine. To be honest, the design has evolved from here but I’m saving it for a little while longer. Nice one Tom. I ran into one of those rare cases the other day where I needed to “put the ruler to the plank” and I had trouble finding my ruler as it so rarely gets used. And then when I found it, the layer of dust on it was indicative of how often it gets used. It’s pretty liberating when you think about it. you’re right. This is one of those things you just don’t ‘get’ until you really start using hand tools.